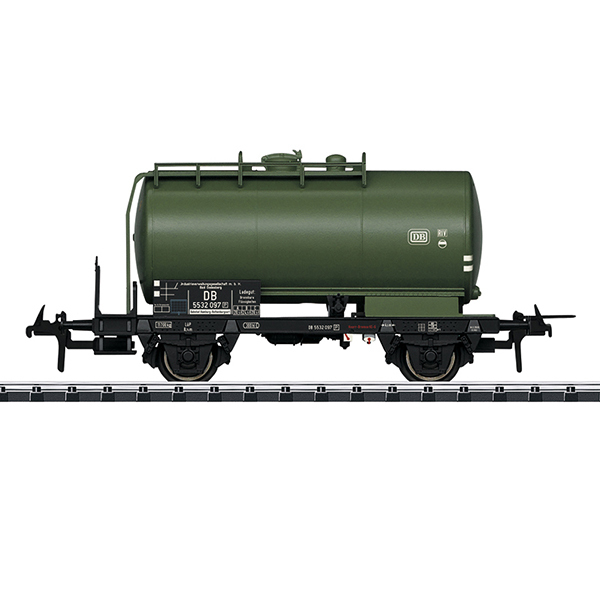 Prototype: Two (2)-axle tank car with a brakeman's platform and a ladder on one end, painted and lettered for IVG (Industrieverwaltungsgesellschaft / Industry Management Company). Used on the German Federal Railroad (DB). The car looks as it did around 1962. Model: The car has a separately applied brakeman's platform with a ladder on one end and a filling platform. The partially open car floor is modelled. Length over the buffers approximately 10.0 cm / 3-15/16". The 33919 tank car is being produced in 2019 in a one-time edition only for Trix Club members. Märklin AC wheelset E36667900. Trix DC wheelset E32376004.